Mastering multiplication facts is such an important component to math fluency. This packet is hands-on, FUN, engaging and provides students with a meaningful way to help master basic multiplication facts from 2-12 while having FUN! Mastering Division facts is such an important component to math fluency! This bundle has tons of hands-on, FUN, engaging and meaningful ways to help students master basic division facts up to 12! The variety of activities included in this bundle help ensure that all students succeed in mastering division facts while having FUN! You can use the division packets as you see fit to target the learning needs and types of your students. There is no wrong way to use the packets. Just PRINT and PLAY! There is NO PREP NO costly colored ink, NO laminating and NO cutting! Just PRINT and ENJOY learning! TWO EXCLUSIVE FREEBIES: only available with purchase of the BUNDLE! 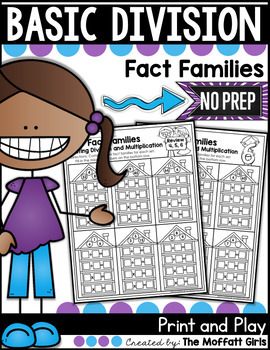 Fact Families are a great way for students to see how division and multiplication work together. 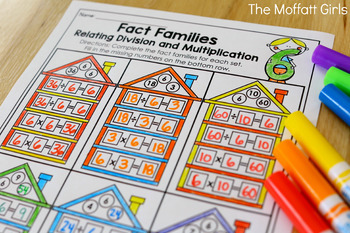 Students fill in the fact family houses with the correct equations. *Each page will focus on a specific divisor. 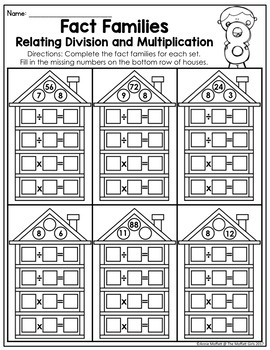 *The top row of houses allows students to use the number combinations to make a fact family. The bottom row requires the students to finish the set before completing the fact family.